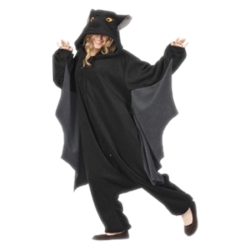 The Bugsy the Bat funsie kids costume will be one of the most comfortable costumes your child will ever wear. It will feel like they are wearing pajamas. Funsies are designed with plenty of room for comfort and movement. The costume features a snap-up front and an attached character hood. The Bugsy the Bat funsie kids costume is colored as pictured. Costume includes one funsie jumpsuit. This costume is unisex so it may be worn by both boys and girls. Available in child size 3T-4T, or 8-10.